How? The action of adjusting venting bias between recirculation and atmosphere is controlled electronically, so you can now adjust the volume of your blow-off valve from the driver s seat! Every turbo-car owner knows that while making noise is fun, there are times when you d prefer to be seen, but not heard. The Deceptor Pro II also features the GFB TMS advantage, which is designed specifically for the purpose of turbo lag reduction and improving throttle response. Tests show TMS features can help return the engine to peak boost up to 30% faster than a factory diverter valve when shifting gears. 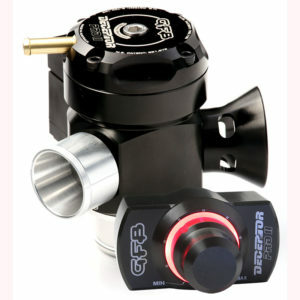 These unique products manufactured in Australia to ISO 9001 can deliver performance with as much or as little noise as you like; with the GFB Deceptor Pro II you CAN achieve a blow-off sound without throwing a CEL, running rich, stalling, using more fuel or causing any other problems commonly associated with atmosphere-venting valves on cars with MAF sensors. Deceptor Pro II TMS Universal (35mm inlet – 30mm outlet)motorised Blow off valve or BOV with GFB TMS advantage. In cabin patented adjustable venting bias system diverter valve.